Hi There! I hope you are having a wonderful post-Thanksgiving week! 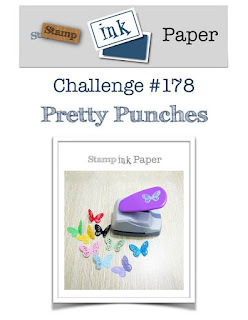 This week we have a super easy and fun challenge for you at Stamp, Ink, Paper. I love this Challenge.... punches are so fun! 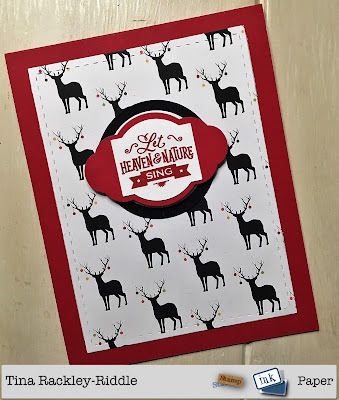 I used the Christmas Traditions Punch Box for my center stamped image and punched it out with the coordinating punch. I layered it on top of the Pretty Label Punched in Real Red and then layered that on a couple of circle punches in Whisper White (1 3/4") and Basic Black (2"). How simple to bring a card to life with a little DSP and layered punches. Sometimes you just need a fast and simple card and nothing is easier than using punches! Labels: CAS Christmas Card, Christmas Traditions Punch Box, Pretty Label Punch, Punches, SIP #178, Stampin' Up!